Good morning! We're at Wednesday already can you believe it? We've had some pretty wonderful weather here, and I just can't help but feel happy with the all the sunshine. I know so many of you are still in the throes of winter and I'm so sorry. This was my view Monday out the window at Holly's. 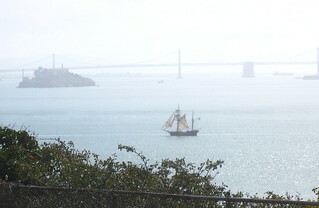 That old looking ship is one of a pair that sails back and forth across the bay. I love working over there, the views are spectacular, the company great and oh my gosh the lunches people. Yum. I've been wanting a smaller purse so I started working on an idea. I got as far as the pocket with the scallops so far. Who doesn't love scallops, and they're everywhere. Wanna see something adorable, check out this bag on Camille's instagram feed. Everyone is hoping for a pattern, can you blame them? I keep forgetting to mention my iron. A lot of you have wondered how I like it. I'm not crazy over it like so many people but it's a good iron. I don't know why I feel like I need to withhold my love for it. It has a nice smooth sole plate that glides easily. Although it doesn't get as hot as my Rowenta, it doesn't leak. So far. I am neutral on the lift system. Wish they could make it silent, that little noise it makes lifting sometimes drives me nuts. Maybe I'm just a crab. I'm in the minority, most people super love it. Would I buy another? We'll have to see how long this one lasts. Do I love the color, YES. Is any of this helpful information. PROBABLY NOT. Sorry. Love the scallops, especially the way that you stitched them on. Such cute fabric too!! Sunny and warm here yesterday, even raked some leaves out of the flower beds and saw some new bulb shoots coming out. Love it, love the view of that water and ship, spectacular!! Good report on the iron, I am always interested in thoughts on them. Mine is a cheapy from Walmart, but it gets the job done. You don't have to apologize to some of us for your beautiful weather PKM -- I'm loving our last (ha!) blast of Old Man Winter. Love those cute scallops -- they look like classic PKM! And I completely agree on the Oliso. 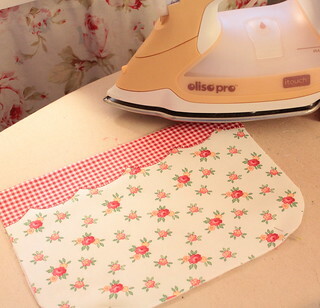 I have the same iron that you do. It works ok, but it's not hot and steamy like my old Rowenta was. Mine leaks just a teeny bit now and then, but I can live with it. And just recently, it has started being picky about the lift -- I have to grip it pretty hard to get it to budge -- not sure what's going on there, but again, I can live with it. I just wish Rowenta could make irons like they used to -- i.e. non-leaky irons LOL. So glad to hear the comments on the iron because I have been admiring that one solely based on the color. I have an old Black and Decker and have been waiting for it to die to buy a new iron, but it keeps doing the job. The Teflon is wearing off the bottom plate though, but no sticking yet. Love how the yellow of your iron matches the yellow in your fabric. Well styled Pam Kitty. Well styled. That iron review is hysterical! I burned through 3 irons in one year. I'm now using a Rowenta Effective that I've had for 2 years. It gets hot and steamy... but then it inexplicably stops steaming when it's not in the mood. Ugh. I like the scallop treatment, too - it was nice to see a preview on Flickr last nite. I totally agree with you on the Oliso iron. It doesn't get hot enough and the noise made when the lift system kicks in is irritating. I've had mine for about two years now and it's starting to have a bit of leakage as well. I'm not sure what iron I will go with next, but I really appreciate your comments on this iron as I thought I was the only one that wasn't "sold" on it. Such a beautiful view....and lovely old sailing ship to complete it. Love your scallops, they are sew pretty! You're my favorite crab. Your review seems honest, I hate effusive reviews that don't seem genuine. Yours seems honest but not mean. Oh those scallops!! !And the lovely view while you are working. Me I see the file cabinets and the copier and everyone who walks by to pick up their stuff from the printer...unless I close the door and then i see my coat and umbrella hanging on the hook. Oh its hump day, i am happier than I thought! !